no namevoting on the Forever? Very good choice of sines/parameters. Still you should have used the remaining bytes for any kind of sound to make it complete. rulez added on the 2013-03-17 15:04:09 by JAC! I actually had sound in an earlier version, but it was just a monochannel version of the "Mortal Kombat"-theme that looped very 5 seconds or so (I can't compose, so I used the notedata from a phone ringtone! 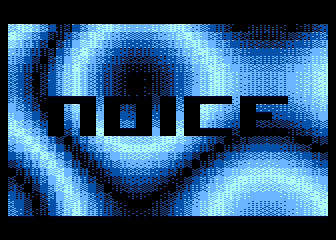 :D) but I thought it probably annoyed more than added to the intro, so I scrapped it and used the additional bytes I got to add the Noice "logo" instead. nice colors and dithering for the plasma. hell, I love plasmas! And this is smooth and 1k. could use 5th color, and nicer palettes. palettes made up from the same hue are boring, and feel dead. also the atari could make 4 pixel high chars, and the cpu power is there to run that fast enough.